#stampinup #faithfulinkspirations With the 2017-2018 catalog, Stampin' Up is introducing its own line of memory keeping products called "Memories & More." I'm so excited about these products--for two reasons. First, they coordinate with Stampin' Up's beautiful line of colors, stamp sets, and accessories. And second, because they make memory keeping so easy--just drop in your photos and Memories & More cards, add some journaling and cute embellishments and you're done! But wait! There's even more to love about the Memories & More products--you can use them in your card making, too! First, we fussy cut the large Berry Burst flower from one of the cards. Next, we stamped a few tiny flowers from the "Color Theory" stamp set in Island Indigo Ink across an Island Indigo Card Stock card base. Next, we cut down and adhered a grid paper card to the card base. 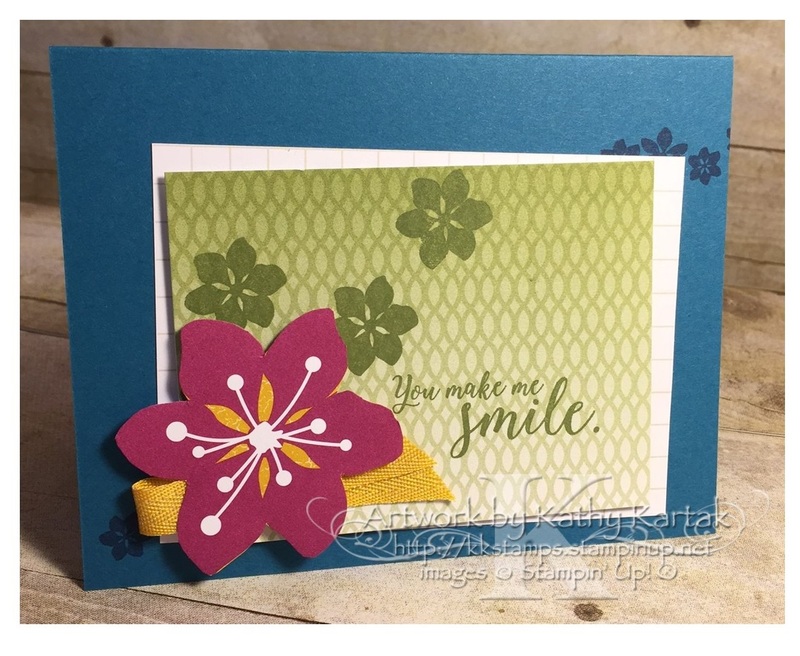 We stamped the larger flower and sentiment in Old Olive onto another card and adhered that to the card. For the finishing touch, we added a 5" piece of the new Crushed Curry 3/8" Mini Chevron Ribbon to the card and then added the fussy cut flower using Stampin' Dimensionals. So quick and so cute! The links to the products below will be active on June 1, 2017, when the 2017-2018 Stampin' Up catalog goes live.